Us, humans have preferences about how we like to go to the bathroom. Have you ever thought about the fact that your favorite feline friend has preferences, too?Your cat needs to love using their litter box, and you need to love the way it’s set up to keep your home clean. If you have a bad litter box, it can cause everyone grief.The IRIS Top Entry Cat Litter Box is a popular choice, but is it the right litter box for you and your cat? This particular litter box has a top entry design, so your cat must hop in and out to use this litter box, and that prevents them from scattering as much litter around when using it. Additionally, a lot of litter will fall off and stay inside the box when they jump out. The IRIS Top Entry Cat Litter Box is for cat owners who are looking for a new style of litter box that more effectively keeps litter box smells and sights hidden away. Plus, it also keeps your cat’s paws cleaner while they are leaving the box. This litter box includes the litter box and a small, slotted litter scoop which can be hung inside of the litter box. Some cats may not like to be fully enclosed in while doing their business, but the IRIS Litter Box has some small openings at the top to let in light and air. These openings keep the box smelling fresh while also giving your cat a better view.If you have more than one cat that tends to fight over the litter box area, this is a good choice to help get rid of that problem. The seclusion makes cats feel safer, and they will be less likely to fight with each other when they aren’t in open sight lines while doing their personal business.Equipped with a grooved lid, you are assured that your cat’s paws will be free from litter before they leave the box and walk around your home. Additionally, the IRIS Litter Box comes with a slotted spoon for easy solid scooping, and there is even a hook on the inside where you can hang it for easy scooping convenience.This box is also a great choice if you have other pets that try to get into your litter box. The closed-off design makes the litter box less enticing for dogs or other pets to dig around in the litter, and that will help keep your home cleaner.One of the final benefits of this particular litter box is that it doesn’t really look like a litter box at all! The sleek design can easily be mistaken for a coffee table or trash can. Nobody has to know what’s really going on inside unless you tell them, and that is a huge plus for many people! When you’re switching from the traditional pan style litter box to a new litter box like this one, you may notice that your cat may not immediately acclimate to using it, and that’s okay!What you need to do to fix this issue is gradually help your cat adjust to the new style. Here’s how to do that:Be sure to use the same type of litter in the new box as you did in their old box.If possible, put the old box on top of or next to this new box, as this will help your cat begin to associate the new top-entry box with their old one. Leave the door open on the top-entry one for the first few days so that your cat can learn that it is safe to go inside. Start to shut the door for few hours every day. They’ll find their way in through the top hole!It will be a process to get your cat get used to the top entry, but some cats end up loving it more than other styles of litter boxes. 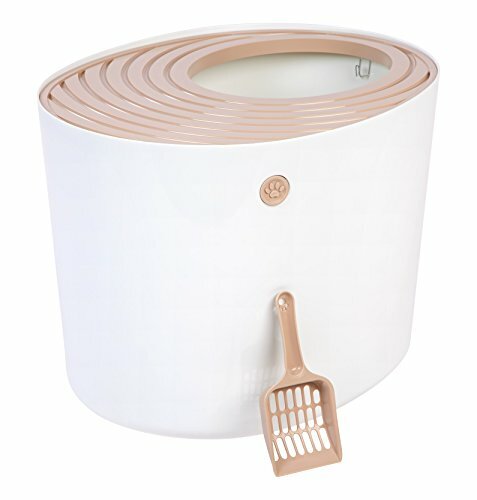 If you aren’t sure that your cat will like a top entry cat litter box but you still want to try a more enclosed litter box to prevent litter from scattering, you might find that the Modkat Flip Litter Box is a good option.This Flip Litter Box has three different lid opening positions, so you can find the perfect level of closure for your cat’s comfort. Plus, there is a side door entry as well, so they can enter the litter box in more than one way. Overall, we have to say that the IRIS Top Entry Cat Litter Box is the perfect choice for those who are dealing with side-sprayers or simply messy cats that get their litter all over the floor. The design of this litter box prevents litter from sliding out of the side when in use, and this can make a huge difference in cleanliness.Plus, it helps to trap odors inside! If you are interested in cat litter odor and scatter prevention, this might be the right litter box to try.